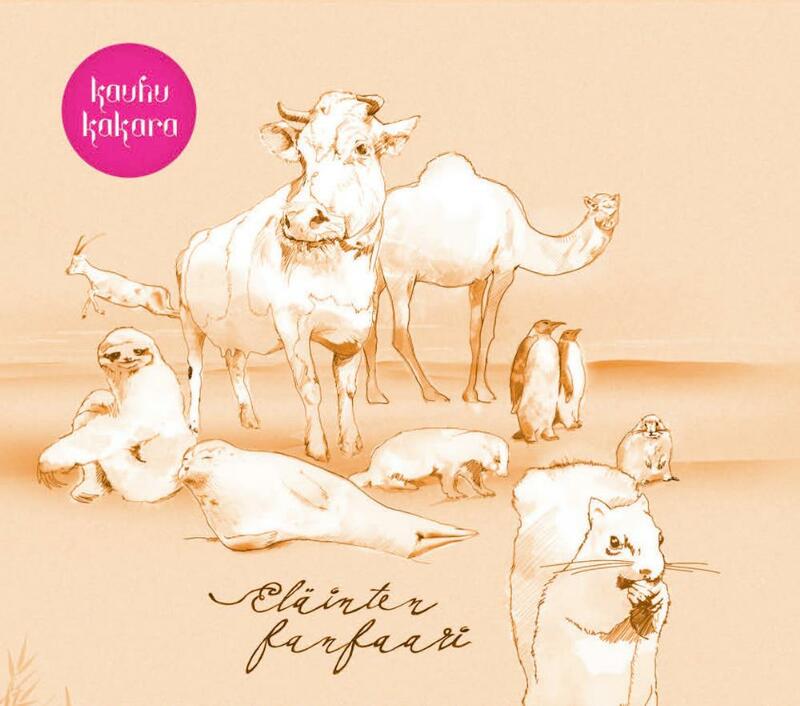 Title translates as "Fanfare For The Animals"
The second album of Kauhukakara leaps a huge step forward towards the realms of lovely fantasies. The past three years have certainly guided the young musicians towards higher planes on the arts of their trade. As the most evident signs of development I would claim more advanced compositions, even tighter thematic appearance of the album, broader use of additional instruments and more extensive use of lyrics in the singing. The album shimmers with musical sophistication and good-hearted humor familiar from the debut album, and time has not changed the basic principles of the sound drastically. The record opens with a "Fanfare for The Animals", driven by piano and saxophone. Klezmer-sounding melodies and jazzy rhythm variations pour playfully like spring's streams amidst a more pompous theme. Melancholic cello notes unite with piano arpeggios in classical manner, and presence of synthesizers reveal the characteristics of modern fusion. The coda has interesting fastening pace, and soon the cavalcade of different animals is brought on display. "Casinoseal" lounges with more relaxed and theme lead by wordless melodic vocals. Bass forms the rhythm with the vintage synthesizers and broad spectrum of percussions participating to the beat creation. Some saxophone lines here sounded slightly similar to early Frank Zappa recordings for my ears. The flow of instruments and themes entering and exiting the stage on these songs strengthen the association of animal parade, in addition of basic song continuum. From financial animals the moods alter towards more loving directions with the "Waltz of The Cowpond", an euphoric love song describing the wedding progression of adorable ruminants. Finnish lyrics sung by Ms. Egecioglu and supported by a male choir is really sweet. As I'm a devoted fan of "opera and other similar stoner music", I appreciated highly the trained classical vocal moments in the climax sequence. "The Spinning Gazelle" whirls in Pacific-sounding glockenspiel party, where the complex rhythmic melodic passages ensure the enjoyment. As contrast to this party whirlwind, when there's "A Sloth in The City", evidently the vocals are very slow and weary, yawning upon the rhythm counting synths. On this song I also noted how adorable it is to hear originally Swedish speaking woman to sing in Finnish. The accent is somehow very special and very cute in my opinion. This sympathetic and loving feeling is consolidated with more vintage synthesizers and subtle saxophone lines. As the city adventures are proclaimed to be enough, cello, Islamic voices and wind instruments rhythmed by the bass take us to "Dromedary's Hurdy-Gurdy Cruising" through plains of Near East. Vocals and piano subtly replace the instruments from the oriental opening instruments, and the scenery changes to lighter impressions driven by piano. When the camel is going with its top speed, even the huge peninsula of Arabia is quickly left behind, and the song ends to tender tingling of bells. Back in Europe, "The Tragedy of Badger Hill" is mourned as a minor-key post-romantic piece for piano, cello and saxophone. This is really beautiful classical European music, concluding mournfully to the church bells. Meanwhile in the absolute south, Arctic wings winds blow in a sound ambience with abstract noises and stalking piano chords, as the "March of The Penguins" is about to begin. The piano finds a minor key pair upon which the bass descends, concluding to a discovery of more hopeful synthesizer theme. Both cello and piano join to these melodic impressions, and are later accompanied by vocals and synths, forming a warm-hearted bolero, which eventually fades to the hollow vastness of myriad sounds from where it emerged. Then leaving Antarctica, a piano staccato announces the start of "Beaver's Mating Dance". Acoustic bass joins the logger on the heat by jumping on the peculiar swinging rhythm, creating playground for duet of human voice and saxophone, all this supported by cute keyboard yells. I was amazed by the details spotted from the fast tempo, and admired the ability to maintain still similarly pleasant and cozy fussing of this song. Later there is a solo for keyboards over rhythmic details of handclaps and even faster vocals and effects. The myriad and joyful passages for funny wood eaters return eventually to its beginning theme. The final "Squirrel's Life" has pleasant cross-rhythmic beat done with hand claps, neat bass melody soon joined by clarinet, singing and keyboards, drawing together all major tonal elements of the record. At the end there are some well-earned applauses and cattle's bellowing. Though the lyrics are sung in Finnish, I would dare to recommend this music for global listeners, as the record's focus is directed to very sophisticated musical information, and there lyrics can be enjoyed also as a melodic instrument, missing their playful meanings should not hinder the listening enjoyment. There is a great variation on the use of instruments, and the compositions have very different principles. Yet these vivid variations create a solid and recognizable sound to the album. This sound has richened and matured to even lovelier directions from their fabulous debut record, and I liked the observation that all band members have composed songs on the album, strengthening the feeling of true friendly collaboration's end result. The musical education is evident through quality of arrangements, ideas and solutions, and still the end result is not difficult sounding elitist avant-garde music, but very emotional, accessible and human. Thus my grandest recommendations of this album from this very promisingly growing brat for You. 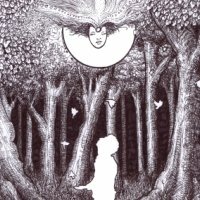 Post a review of KAUHUKAKARA "Eläinten Fanfaari"